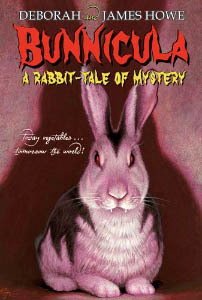 Bunnicula: A Rabbit-Tale of Mystery is a classic children's book written by Deborah and James Howe. First published in 1979, I recall vividly growing up with either Bunnicula or one of its sequels being offered in the annual book-drives at my school. Alas, I was too poor to buy new books, and by the time that changed, I felt my reading level was much too high to bother with kids' stuff. Happily, I'm much less of a snob now! This book is cute and endearing. Written from the point of view of the family dog, the story is sweet and innocent, even if one of the human boys is slowly poisoning the narrator with chocolate cupcakes. Harold only sees the positive in things. Chester's reaction to the new pet makes the dog feel concerned. The cat's just read too many horror stories! This is a funny, whimsical tale with a well-composed plot and perfect internal logic. You won't believe it was written by a dog. 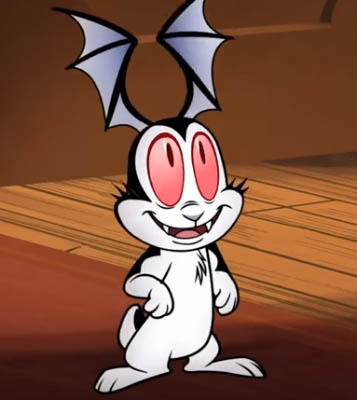 There are seven books in the Bunnicula series (the last one came out in 2006), plus a spin-off series, as well as a learning-to-read series of picture books. There was also an animated TV special produced by Ruby-Spears in 1982, and more recently, an animated series in 2016 that aired on Cartoon Network and on Boomerang. I haven't touched any of these yet. Oh, man, I remember reading this when I was a kid. I loved this book series. It had just the right balance of serious and campy humor. Bunnicula came out after I grew up, but I still read and enjoyed the first three books after reading an early-1980s review of them. I never got around to the later books and the TV cartoons. You encourage me to get the books from the L. A. public library.